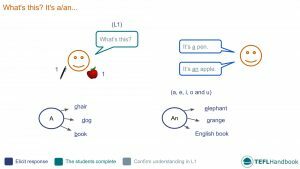 EFL - ESL activities and games for asking "What's this?" A collection of ideas and resources for teaching young learners how to ask and answer basic "What's this?" style questions. Feel free to use these ideas to form the basis of a lesson plan or to supplement an existing one. If you're an iOS or Android user, try this lesson out on our TEFL Handbook app. It gives you offline access to all of our materials, perfect for quick reference in the classroom. The sample ESL board work introduces students to the dialogue and grammar that will form the focus of this lesson. Students learn to ask basic questions and identify the correct indefinite articles to use with their responses. As always, the teacher should try to elicit as much as possible from the students using actions or the students' L1. Students have to fill in the gaps with the correct article. Have the students work on these individually, and correct the exercise together at the end. A quick and easy speaking activity where the teacher asks questions about different items in the classroom. Go round the room asking each student a question about an object in the classroom. Before they begin, go over the language structure of the answer that you will expect and add a simple example to the board. The students work in pairs identifying different objects in the classroom, using the target language for the lesson. The students will work in pairs, moving around the room identifying classroom objects using the language from the previous activity. Monitor them for the correct usage of articles and help them with any new vocabulary they encounter. Two teams of players race to the board to add statements containing articles. To begin, divide the class into two teams and have them form two queues at the back of the room or at least a metre from the board. On each turn, a student will move to the board and write a word (including the article). When they have finished writing their word, they'll hand the marker to the next person in their team. Students are not allowed to copy words from the opposing team's list. The round ends when everyone from one of the teams has had a turn. To encourage longer answers, score a point for each correct letter. If you'd prefer a lesson plan aimed at children, this free lesson at fredisalearns has you covered. islcollective have a 'what's this?' worksheet that would complement this lesson very well. Finally, if you want to add some video to your lesson, this video by masteringarticles was our favourite. We hope that you were able to grab a few ideas from this lesson plan. Our suggested next lesson is on teaching plurals. Be sure to check out our full list of ESL lesson plans for beginners (A1 Upper), as well as the complete collection. Also, if you're an iOS or Android user, the best way to view this content is through the TEFL Handbook Android application. An ESL lesson planner for English teachers, designed for in-class use.